Many of us will be experiencing higher levels of contact with interdimensional beings this year. These interactions will be intimate and scattered, rather than a collective mass-landing. With energetic shifts in progress, and the organic timelines overriding old realities, we may now embrace first contact as a clear, direct, benevolent and Ascension-enhancing experience. How to establish contact, why, and with whom. Creating a vibrational environment within and without for contact. 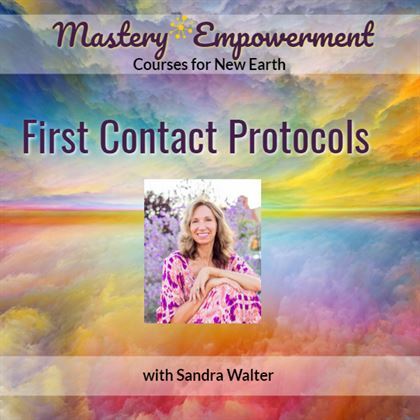 Sandra Walter has experienced several ET races, Higher Beings and Inner earth civilizations. She will share clear guidance and insights on the new unfoldments with contact, and how to integrate these experiences as we walk between worlds. Sandra Walter is a Wayshower, Ascension Guide and Gatekeeper. As an Interdimensional Liaison since 1999, Sandra assists awakened HUmans through writings, videos and creations focused on Ascension. She inspires the exploration and evolution of HUman consciousness, bridging the multidimensional worlds to create peace, self-realization and a deep understanding of the Ascension process. Sandra shares information as a pure conduit to empower, inspire and accelerate the Ascension of HUmanity. She is a published author, certified Life Coach, artist and Energy Healer. Sandra lives in Mount Shasta, California.